The DTAG100-PRO smart beacon and dynamic tag from Dot Origin is a complete, boxed unit that enables easy configuration and rapid modification of BLE beacon and NFC tag data via USB. Based on the well-established range of intelligent beacons and dynamic NFC tags, the DTAG100-PRO is designed primarily to connect directly with digital signage, media players, PCs and other systems, offering complete platform independence without the need for software drivers or any knowledge of NFC, iBeacon or Bluetooth Low Energy protocols or data formats. Once configured, it will also operate from any USB power outlet, providing maximum flexibility for deployment. The DTAG100-PRO is suitable for use in many applications including BLE- and NFC-enabling out-of-home (OOH) advertising platforms and other digital signage products and solutions, as well as for interactive kiosks and payment applications. 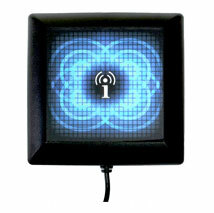 The built-in software-controlled hotspot highlighting LEDs can be used to enhance the user experience where appropriate. Now comes with FREE Bipzone app for iOS and Android � no mobile development effort required!